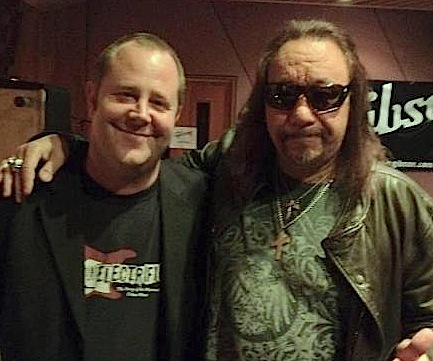 Thanks to my pal Dusty Wright of CultureCatch.com I got sit in on an interview with Ace Frehley done by Director of Artist Relations at Gibson’s NYC Showroom Jim Felber about the release of the Epiphone Ace Frehley Budokan Les Paul Custom. Ace was so mellow and cool; he had just been on with Matt Laurer of NBC’s Today Show that morning in conjunction with the release of his autobiography No Regrets and was now doing a photo session as well as interview at Gibson. Good times. Just prior to the interview as we were mic-ing him up for the interview, Ace picked up the Epiphone guitar and handed it to me saying softly, “can you tune this and give me a little distortion? yeah?…. thanks”. Two nights before I had caught Ace at BB Kings in New York and he had fallen off the stage. He could have been hurt. When I told him I was at the show he said “yeah, that was a drag….falling…. the funny thing is the bridge of my Les Paul really took all the force of the fall and it snapped the bolts…. if it hadn’t I might have broken an arm or leg”. Ace was not really what i had expected. Being completely honest with you: he came off like a wise old indian chief. He knew how to make everyone feel at ease and welcome and seemed happy to be there but not hell-bent on being the most important person in the room. Engaging but mellow. It’s hard to tell on the video because of his shades but during the interview Ace would look around as he was telling a story and the couple moments we connected still fills the sails with a fresh Frehley “AWK” air!! At one point Ace said, after playing a bit, “I’m better with my band” which really showed me a level of humility I had not really anticipated either. At was as if he assumed we were all guitarists there anyway and he was just another guy into them. That’s when I saw it for the first time; Ace the reluctant hero. The underdog who can jam, The dude you were rooting for, waiting with each other for the guitar solo, picking his moments tp shine. Hey, lady space? you better wake up fast!!! 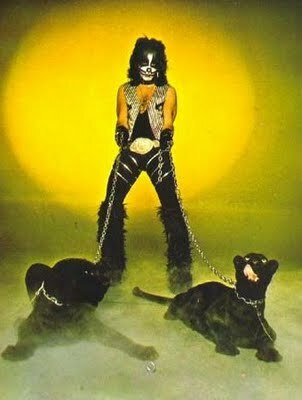 So yeah, I actually got to sing Peter Criss’s Kiss classic “Beth” to his former wife, Lydia Criss, at the NJ KISS Store convention a couple years ago. Lydia accepted the Peoples Choice Award on behalf of Peter and the band in 1976!. I threw Lydia off a bit by the video camera and the ambush when I interviewed her impromptu and, when she admitted “Beth” was her favorite I said “Would you like me to sing it to you?”. What an honor. Lydia Criss is a classy delight to have met. You must check out and buy her book Sealed With A Kiss Great pics from a great photographer behind the scene’s as she was and a great story-line throughout the book. Like a mini-Kisstory slanted Peter’s way. Nice.